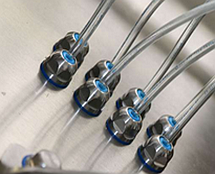 PFLITSCH manufactures cable glands and trunking in various grades of stainless steel for many industries, including plant engineering in the water supply/waste water and the offshore industries. The company’s closed and open trunking systems route cables optimally through machinery and plants. They are available in various cross sections from 15 mm x 15 mm to 600 mm x 150 mm. On request, PFLITSCH designs and manufactures ready-to-install trunking components while offering high cost transparency. PFLITSCH cable glands – available in sizes M12 to M63 for cable diameters up to 44 mm – ensure durable, vibration-resistant cable entries into housings and provide the high protection type IP 68. Their gentle-action, large-area seal prevents irreparable indentation of the cable sheath. A particular highlight is the blueglobe CLEAN Plus® cable gland, which PFLITSCH has developed and certified specifically for highly demanding hygiene applications. It has smooth surfaces (roughness Ra < 0.8 μm) and a rounded transition to the faces in contact with the wrench. High-grade 1.4404/AISI 316L stainless steel is used for the cable gland body. blueglobe CLEAN Plus® is available in sizes M8 to M40 for cable diameters up to 29 mm.